Pie crusts are pretty intimidating if you're an at-home baker with little experience, since there's a lot of science behind making them. A perfectly flaky crust that's golden brown—not charred and black along the edges—requires careful attention, a foolproof recipe, and some decent baking skills. 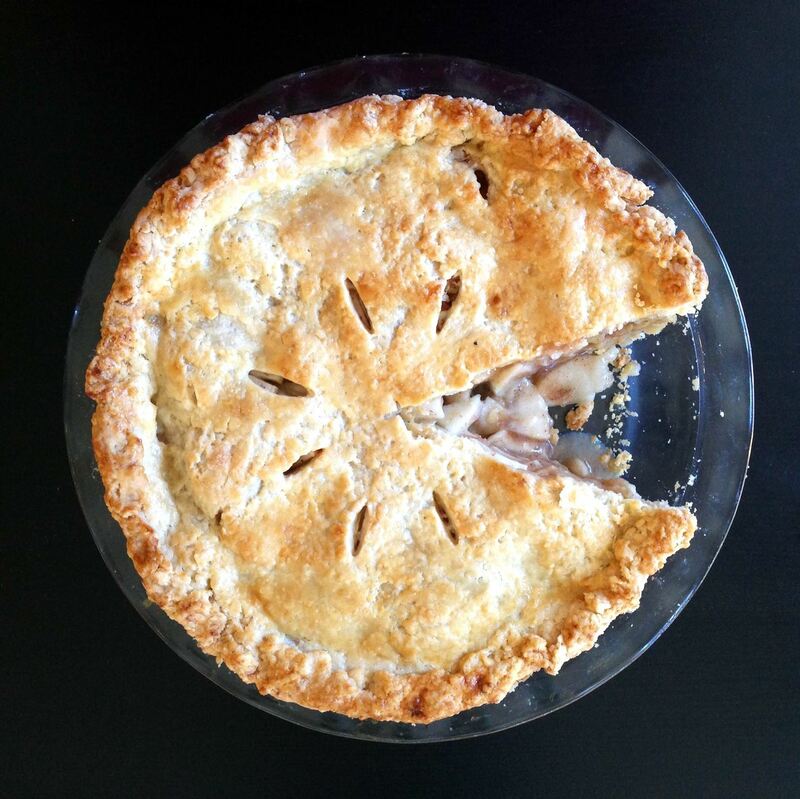 If the thought of creating your own pie crust makes you nervous, skip the stress altogether with a little vodka. And no, I don't mean drink it while you're baking. Add it to your dough, and your crusts won't crumble in the worst possible ways. What, Exactly, Does Vodka Do to Your Your Crust? According to Layla Eplett at Scientific American, a pie crust requires a balanced combination of flour, liquid, and fat. If these ingredients aren't measured carefully into the right ratio, your crust will vary in consistency and texture. Variation in type and proportion of these three ingredients can result in vastly different pies—ones that can be flaky, crispy, mushy, crumbly, or tough. Typically, when your liquid and flour come together, gluten is produced—and that extra gluten in your pie crust dough can alter the final product in potentially unexpected ways. Plus, a tougher dough means a dryer dough, which is harder to roll out. It's even worse if you're using bread flour instead of all-purpose, cake flour, or pastry flour, since the former has more gluten in it. If you choose vodka (the cheap kind is okay) as your liquid rather than a more traditional option like water, milk, or even vinegar, you won't need to be as careful with the balance of your crust's ingredients. And that's because vodka is a mix of alcohol and water, and alcohol doesn't aid in any gluten development. Vodka is about 60% water and 40% ethanol, which means that only 60% of it is actually active in aiding gluten development. Meanwhile, 100% of it is active in moistening the dough. By using vodka instead of water, you can add more liquid to your dough, making it easier to roll, while still limiting the gluten development that can threaten to turn your tender dough tough. The ethanol in the dough ends up vaporizing when it's baking in the oven, so you don't have to worry about your pies being all boozed up. 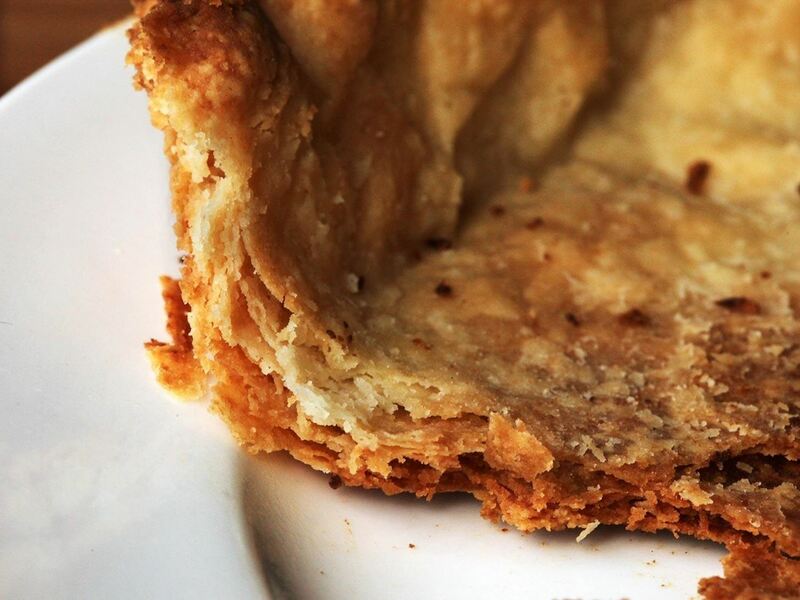 You'll just get a flaky, tender crust, just like you want. If you're not a big fan of vodka, and can't imagine buying some just for this—you don't have to use it. This pie crust hack works with any type of 80-proof liquor, so brandy, whiskey, and even applejack will work. Now that you know the secret to the flakiest, most tender pie crust possible, it's time to perfect your baking skills. Be prepared for more moisture than usual. 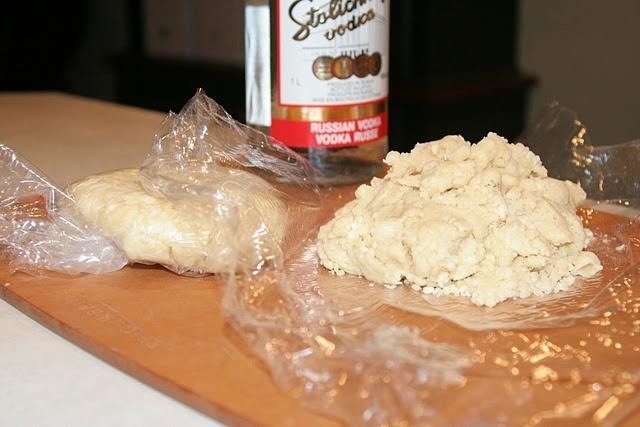 You're free to keep adding vodka to your dough to get it rolled out with ease. However, this makes for some seriously sticky dough as well. Chill your dough before you attempt to roll it out. This reduces the stickiness that appears after mixing, and stiffens the dough to prevent a gooey mess on your rolling pin and surface. It's okay if your dough doesn't look perfectly, beautifully smooth and flat once you get it inside your pie pan—it will still bake evenly and turn out as expected. Pat your dough against the pan as best as you can, moving from the center outwards. Once you remove your vodka-infused crust from the oven, don't be afraid to try a taste. You'll discover that your pie crust woes are in the past, and all that's before you is a flaky, tender, and wonderfully moist base for your pies. Yuppie Frozen Pizza Taste Test: What's Your Favorite?